What Causes a Gas Oven to Leak Gas When the Knobs Are Turned Off? Owning a gas stove comes with the potential risk of a gas leak. When natural gas leaks, it causes a physical reaction in humans and animals, which worsens with prolonged exposure. Left untreated, the leak increases the risk of an explosion from a spark or other source. A gas stove might leak, even if you turn off the knobs on the front of the stove. A stove leak is dangerous to anyone in your home. Natural gas providers add a sulfur scent to the gas, which gives you a warning sign when you have a gas leak. Even if you do not smell an odd scent, your stove might still leak. A gas leak causes some flu-like symptoms, including dizziness, nausea, fatigue and headaches. With prolonged exposure, you might notice stomach pains, vomiting and that your healing slows down. The problems affect both humans and animals, including your pets. 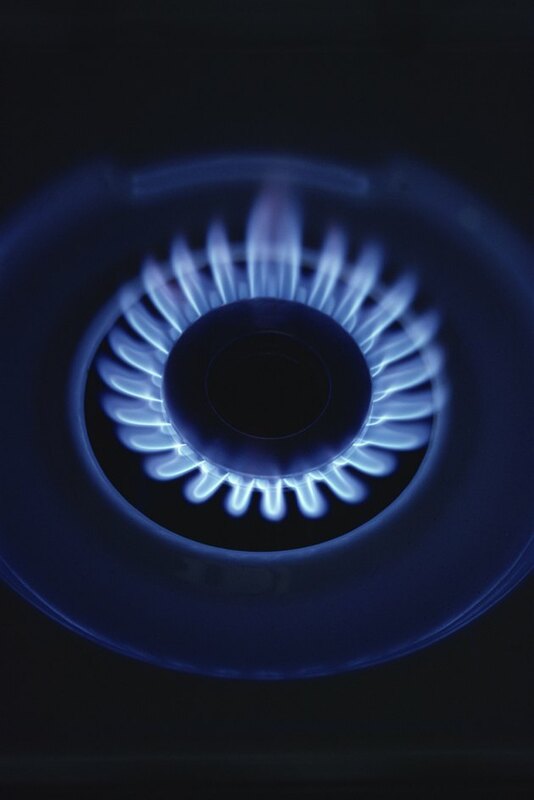 A gas stove has a fuel line that transports natural gas from a propane tank outside your home to the inside stove. The knobs on the front of the stove do not control the fuel line, but the level of the flame on each burner. You typically turn the knob, which makes a clicking sound and begins pushing fuel through to the burner. When you place a flame close to the burner, the gas ignites and provides heat for cooking. As you turn the knob, you adjust the size of the flame for faster cooking or slow cooking. If you notice a gas leak, check the knobs carefully. Until the knob clicks into the proper position, the fuel still flows through the line. If the knobs are turned off, but have not clicked fully into the off position, the stove can still leak gas. Problems with the fuel line itself can also cause a gas leak. The fuel line has a connector that attaches the line to the stove. A broken connector might let the gas escape from the line, especially if you have multiple lines attached to one tank. Broken seals are another cause of leaking gas. Get help as soon as you notice any signs of a leak. Go outside and contact your natural gas provider. Any type of spark might create a fire or explosion, including sparks caused by lights or the telephone. Do not use any type of electronics near the stove, until you fix the leak. The gas provider should send a technician that checks your home for potential leaks. Why Do the Burners Work but the Oven Does Not Work on My Gas Stove? What Are Some Safety Features on Gas Ranges?